This is a Heng Long M41 radio controled which I improved... a lot! 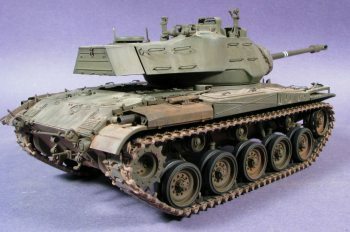 I always liked the Walker Bulldog and I think that the AFV release is a good representation of this American tank. If I haven’t built it before, is because I like vehicles that in one way or another, saw service in the Middle East. 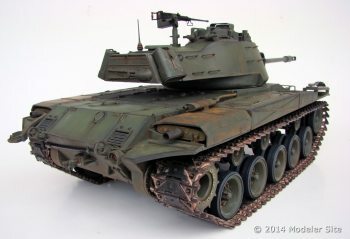 After 30 years of the Tamiya old mold, around 2002, and nearly by the time AFV Club and Skybow announced two new molds of this important light tank. Both kits (Skybow and AFV Club) are excellent, but the Skybow´s includes a mantlet cover made out of soft plastic, a similar material used for the tracks. Though this mantlet cover was not obligatory (in the real thing it was a dust cover and could be removed to leave the metal mantlet exposed), most of the pictures show it placed.